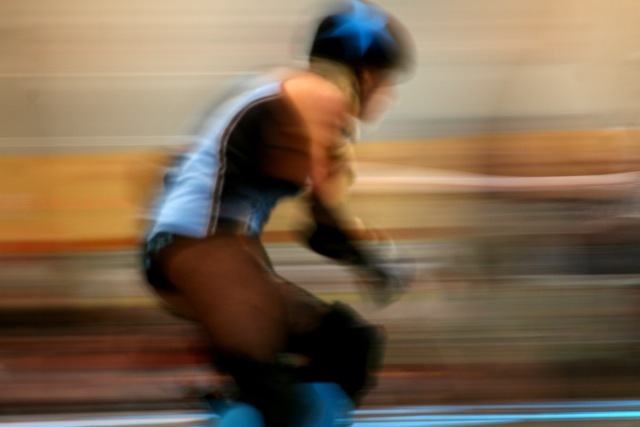 Do you love roller derby? 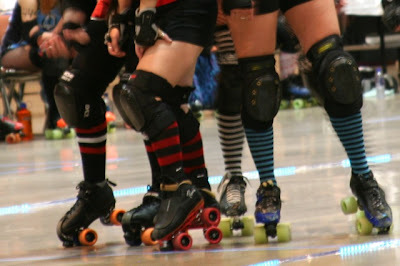 I love roller derby. I was obsessed with Rollergirls, a derby show that aired on A&E a few years ago. I loved the real-life stories of each of the girls and my favorite players were Lux, Punky Bruiser, Miss Conduct, Chola and Venis Envy. I dreamed of getting a pair of skates and striped legwarmers and getting knocked around (even though I knew realistically I couldn't take the hits.) 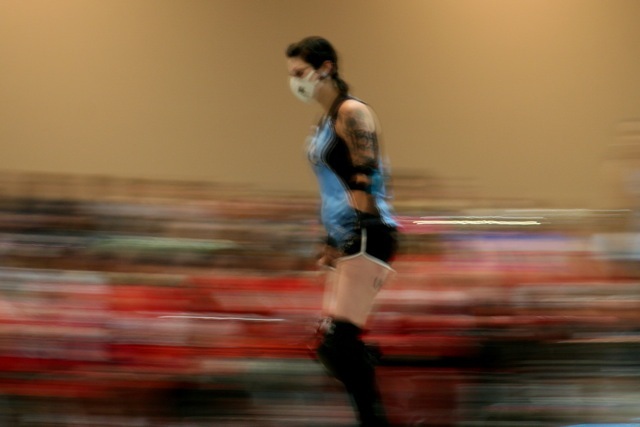 But I fell in love with the sport and the sisterhood. Anyway, my pal Shana (that's her on the bike!) told me that Bo and I should come out to see the undefeated Mid Iowa Rollers in their bout against the Iowa City Roller Girls over the weekend. So we did, and what a RAD time we had. 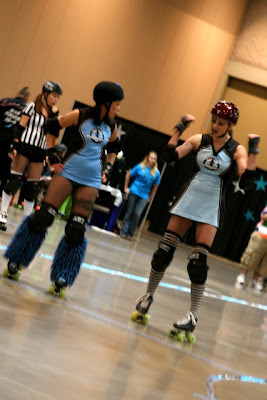 Here's the Mid Iowa Rollers in blue. 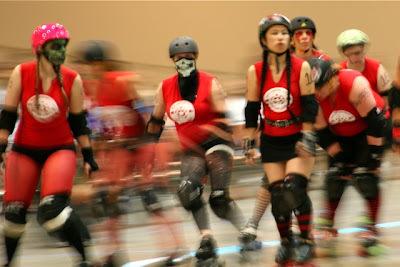 And the opponent (OCCRG) in red. 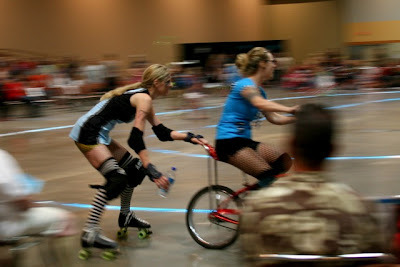 And now I have some new favorite roller girls. Like Anna Killakova. They were up, they were down ... knocking each other around. These girls are majorly tough! The home team was trailing by about 20-ish points until the very end and had us on the edge of our seats. They were literally flying past us ... too fast for my camera. Such a thrill! The final 15 minutes were intense as we all cheered on our jammers and time and time again, they fought and powered their way through the pack ... go, go, go! 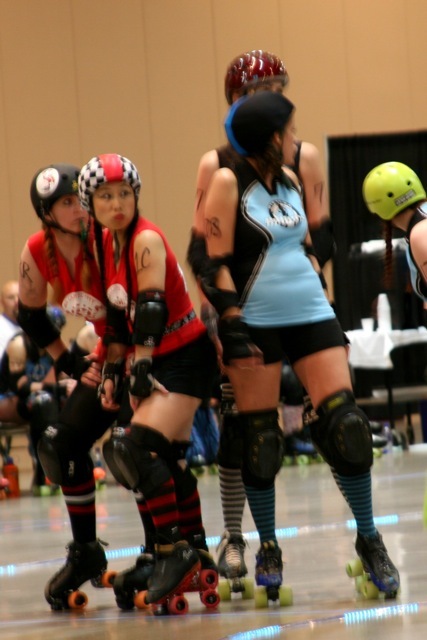 And in the absolute final seconds of the bout, the home team pulled ahead by three points for the win!! Such an amazing and well-deserved victory; such a hard fight to the finish. We had a blast watching you battle it out, girls ... and you can bet we'll be back to see you soon! I thought high school competitive soccer was rough and dirty until I heard about this sport. I used to be able to play hard with the best of them in my day but I'd be scared to meet any of them in a pair of skates. I'd love to go to a match, though. Thanks for posting about it! 183-180!!!! A crazy finish! I think at the half, MIR was down by 40 points. A very valiant effort made by the ladies OCCRG and MIR. 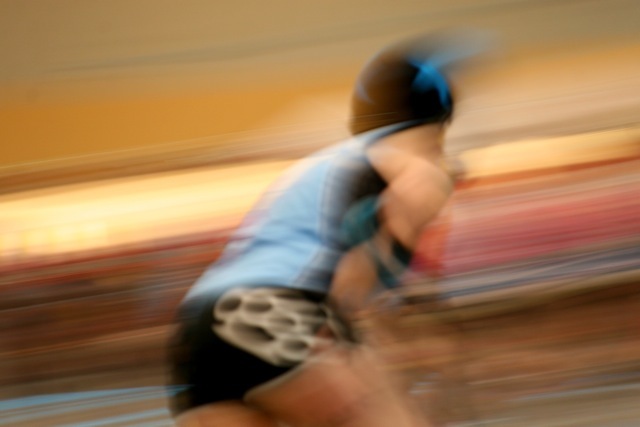 They threw it all down on the track, blood, sweat and tears. If you need more roller derby (both of these are streaming on Netflix), you should watch Blood on the Flat Track. 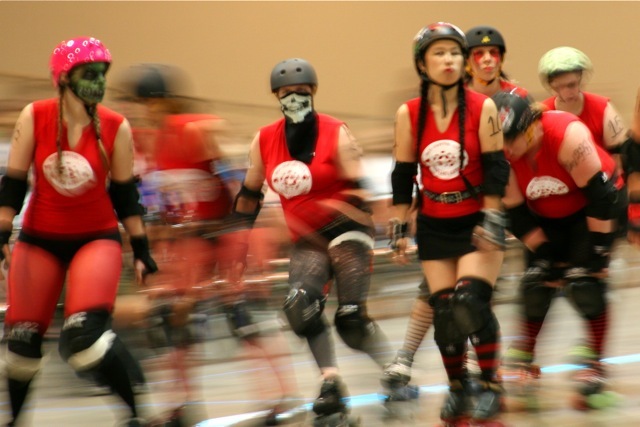 It is about the Rat City Roller Girls in Seattle. SO, SO GOOD. 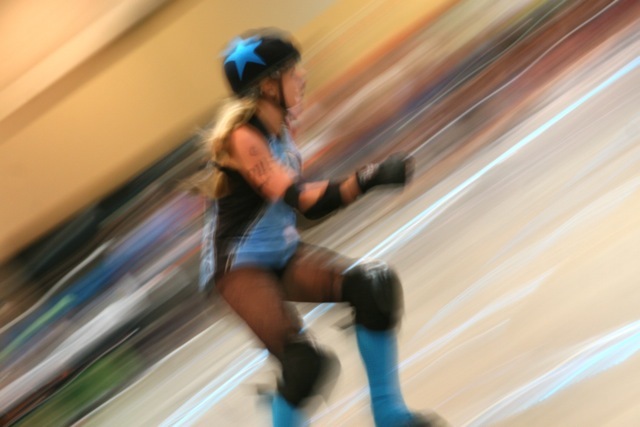 If you want to watch more about the revival of roller derby in 2001, check out Hell on Wheels. 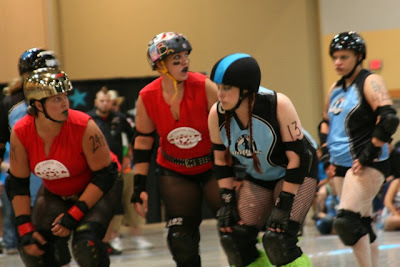 Next home bout is JULY 17th at Vets Auditorium! Thanks for coming, Jen and Bo!